Sagittarius is the most southerly of the constellations of the Zodiac, putting it at the very centre of the galaxy. Lying as it does between Scorpio and Capricorn, Sagittarius is very close to the star-rich regions of the Milky Way. It can be difficult to see from countries in the northern hemisphere of the world due to its southern location in the sky. Some 22 of its stars are known to have planets, meaning that it has more planetary hosts than any other known constellation. Although its name means 'the Archer' in Latin, many contemporary star gazers feel that the constellation's shape is more reminiscent of a tea pot and the misty star clusters of the Milky Way resemble the 'steam' from the spout of the tea pot. The brightest star of the Archer, Epsilon Sagittarii, is 250 times as luminous as the sun. 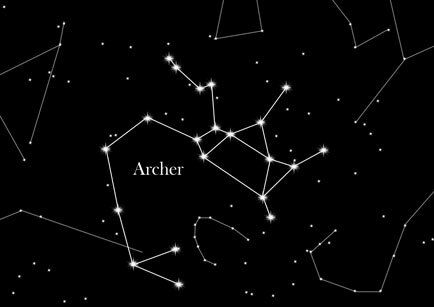 If you like to find the Archer in the skies the constellations of Capricorn and Scorpion can act as guidance: Capricorn is to the upper left, the Scorpion to the lower right of the Archer. The constellation was first identified by the Babylonians and then the Sumerians, the latter identifying it with the ancestor god Pabilsag. The Greeks gave the constellation the name of Chiron, the same character as Sagittarius, who was a centaur. A centaur is a creature who has the torso of a man and the body of a horse, known for its skills with a bow and arrow. Chiron, a poet and wise mentor to mythological heroes such as Hercules, Achilles and Aesculapius, was immortal. Wounded in the hooves by a poisoned arrow, the pain made him want to die. As a result, Zeus placed him in the sky. Astrological significance: Sagittarius is a sign of the Zodiac, and astrologers assert that people born under the sign of 'the Archer' are fun-loving types, open to new experiences and with a ready sense of humor. Idealism and a fiery dedication to justice can also characterize people born under this sign. The element of Sagittarius is fire.